Are you ready to take self-responsibility and consciously create the change you’ve been seeking in your life? Well then let me introduce you to the NEW and revised edition of the Peace Pack! A beautifully presented and simplified edition designed to guide you to finding your own inner peace through step by step processes. S.H.E Change Movement – in this workbook you gain an overall understanding of the Peace Practices to learn how you can declutter your mind, release overwhelm and create inner peace. S.H.E Change Journal – this journal is for you to work through the Peace Point Equation, giving you the clarity and confidence to create the change you’re seeking. 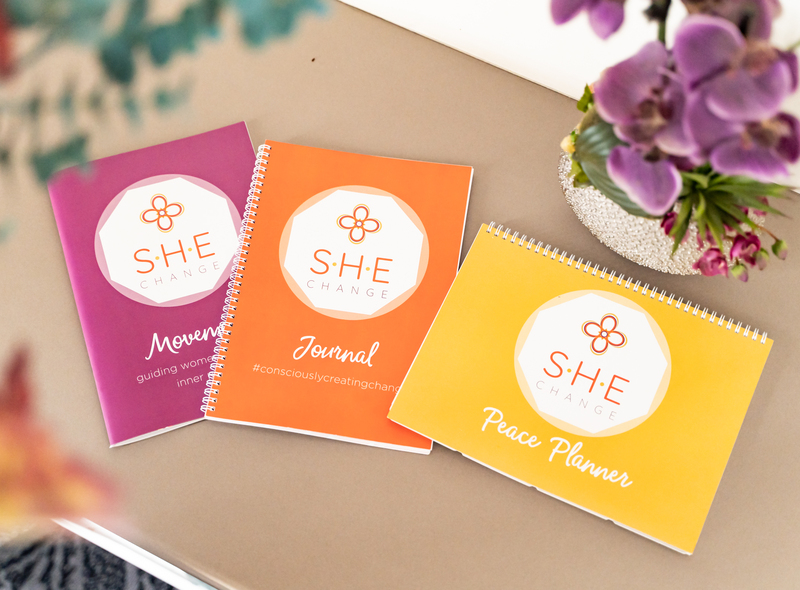 S.H.E Peace Planner – the planner is going to be your new best friend 😉 – You’ll turn your ‘have to’s’ into ‘choose to’s’. Allowing you to say goodbye to procrastination and hello to empowerment! What can a Peace Pack do for me? As women, we often find ourselves stuck in the rut of life. We can feel isolated and become overwhelmed with everything we think we “should be achieving” or that we “have to do” and feel under constant stress, like a hamster running on a wheel, super busy but not actually getting anywhere. This pressure not only comes from ourselves but our perceived pressure by others (society, family, partners, children) often leaving us feeling drained and misunderstood. Allow you to make the time to really focus on YOURSELF! Whether you are fighting waves of overwhelm, suffering from episodes of anxiety, feeling lost and frustrated with your current situation, struggle with guilt and procrastination or simply want to take your self-awareness and personal development to the next level – you will find huge value in these workbooks. Join the S.H.E Change Movement and let me share with you the Self-Awareness, Healing & Empowerment tools that have been created for you and every woman, to shift you into a predominant state of inner peace within all areas of your life, leaving you feeling genuinely in control and better equipped to deal with unexpected life situations. You owe it to yourself to create your own inner peace!